What: I remember there being one particular store when I was a kid that had the best toy vending machines, which I usually got just as excited about as any toys that could be found on the store shelves. It was my local Toys R Us, and it's where I got a good portion of my bootleg mini figures. The general theme of one of the vending machines they had there was creatures from outer space, and for a quarter it would produce all sorts of Japanese toy knockoffs, from M.U.S.C.L.E. bootlegs to various kaiju to robots. And most of the time, the robots were one of the guys pictured above, which are bootlegs of Gundam toys. Back then I had no clue they were Gundam bootlegs, or even what Gundam was. I still know very little about the anime and couldn't tell you who any of the particular characters are supposed to be, but I'm glad to at least know what they're knockoffs of! 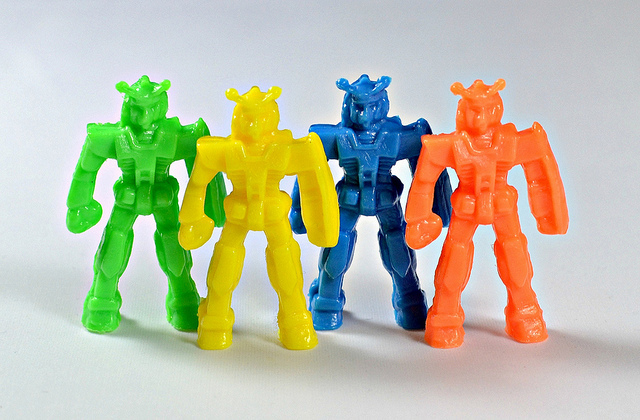 These are made of hard, light plastic and come in all sorts of colors. 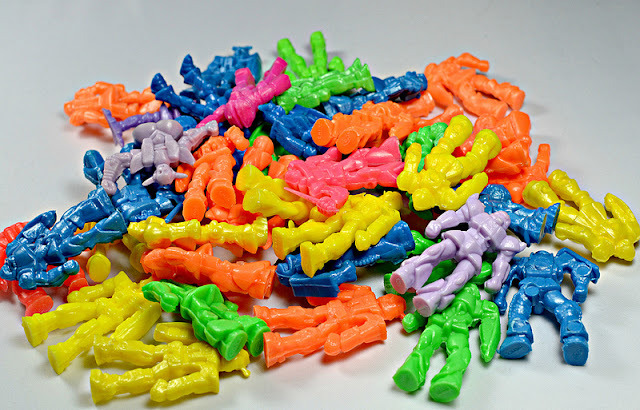 Some sculpts are still sold as party favors today, but the colors seem to be limited to orange, yellow, green and blue. I don't know exactly how many sculpts there were, but an example of each different one I own can be seen in the first photo above. When: I got most of mine from the early-mid 1990s. Some of them are still available to buy today, but as party favors, not vending machine prizes. Where: Sold as prizes in toy vending machines, plus as party favors. Top image from left to right: Z'gok, Gelgoog, Big Zam (A really tiny one), Zaku II, Dom, RX-78-2 Gundam (above), Zeong (Below, again really tiny), Gyan, Acguy, Gouf. Only one Feddie suit in the lot, eh? No Guncannons, Guntanks, or GMs? Be warned, though: You don't get all the colors they show in the photo. Only blue, yellow, orange and green. I just got three of these in rubber...maybe the original vending machine toys the plastic ones where molded from? They are also stamped Rigo China on the feet, just like the plastic ones are. They all came in red. I have a few of the plastic ones too. They just kind of show up in lots that I end up buying now and then! I just sold at least one of these when I decided to focus on rubber toys, but now I feel silly for doing that. Here's hoping I still have some buried in a toy chest somewhere. I think you can still get a big bag of them on Amazon! Try searching for robot party favors. are these considered to be knock off micro machines? I don't think so...aren't Micro Machines toy cars? Awesome! I actually won some of these in 1988/1989 at http://www.scandiafun.com/victorville/index.php mini golf/arcade. 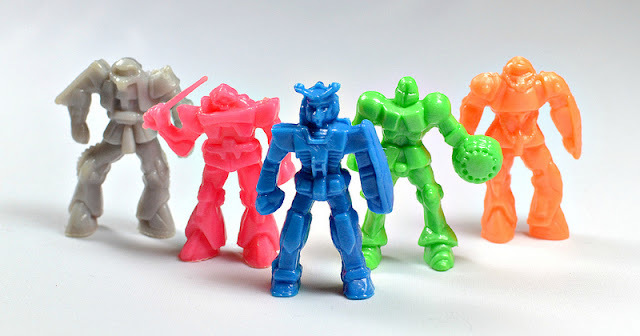 I traded in prize tickets from skiiball for them, and at the time I had no clue they were Gundam. You can still buy these robots - and spaceships - on ebay. Bought a whole lot - beautiful sculpts of robots AND spaceships. VERY nice. Lots of different models. I liked them a lot.